1. Is monolinear type design considered 'normal' in Arabic design? I know it exists, but is it really accepted, or is it considered a sort of Westernization? 2. What are good examples of (preferably open source) Arabic monoline fonts? 3. Are there examples of Latin sans-serif typefaces with an Arabic kind of flavour? Or, vice versa, Arabic sans-serif typefaces with a Latin flavour? For 1, I think the feel is similar to how Latin-script readers view monospaced fonts, so not particularly Westernized, maybe more simple or unsophisticated. Anecdotally I also understand the acceptance on monolinear Arabic varies from region to region. For 3. maybe the Latins in Sakkal Majalla are worth a look. 1. Monolinear designs don't have similar function in Arabic. I don't see Monolinear typefaces used in print for Persian readers as much as it happens in Latin. I see them more on screen but sometimes I think it's because operating system default fonts forced the readers to read more low contrast typefaces on screen especially on web. Although they're becoming more accepted in recent years. The trick was to let go of following the Latin shapes and Latinziation and design just authentic low contrast typefaces. I'm talking about Iran, can't talk about rest of the Arabic script readers. 2. If you're strict when it comes to shapes, finding a good example out there is hard and I prefer not to mention my own work. I remember "Lalezar" typeface designed by Borna Izadpanah on google fonts is popular and is open source. 3. I think most of the typefaces which are called Kufic are Latinized and not actually based on Kufic style. One good example is AwanZaman in my opinion. For Arabized I don't remember an example. Just curious how this information would help? Btw there is no serif in Arabic so lets not call Arabic monolinear or low contrast typefaces Sans or Sanserif. I want to take a monolinear shape that could work as both an Arabic letter and a Latin letter, let's call it X. Then, I want to let X be seen as Arabic or Latin based on its surrounding letters, which will be clearly Latin, or clearly Arabic. That's not really the point of the study, but I hope it helps a little bit in explaining my questions. @Bahman Eslami: Apologies for my ignorance, but I see I have forgotten to ask another question. The participants of the experiment who can read Arabic are most likely to be Moroccan, Turkish, or Syrian. Do you think Kufic would be familiar to them? What style is used by Al Jazeera? @Jasper de Waard No need for apologies, I'm also not aware of reading habits for the rest of world. But I think low contrast Kufic style has become popular in Arab world (not Persia) despite its suspicious origins, so the readers of Morocco or Syria won't have trouble reading them. My problem is mostly with the aesthetics of the style that makes me cringe. I can't say a typical Turkish reader would be able to read Arabic script since their official alphabet has become Latin since 1928. @Bahman Eslami Thanks again for your information! I'm aware of the Turkish situation, but I believe some still learn Arabic in sunday school, at least here in the Netherlands. Another question: Firstly, what do you think of Noto? And, can you tell me why there is a Noto Kufi Arabic, a Noto Naskh Arabic, and a Noto Sans Arabic? How should the latter be classified? Firstly, what do you think of Noto? I think Noto Naskh is not a bad typeface, but it's not my cup of tea. why there is a Noto Kufi Arabic? There is a demand for geometric Arabic typefaces. Latin structure is more geometric and symmetrical; western world seems more progressed so Arab world assumes what western world has done ought to be right, so maybe they should copy what the west does. I actually heard in a talk in Iran "Latin typefaces become more geometric to become more legible!". So people are trying to justify this with their own fantasy. This is not only in the script, it's happening in many aspects of Arab culture. If you take a look at Arabic script before 20th century you see how this adaptation of script has creeped into the writing system. The script used to be completely different. The way to justify Geometric Latinized Arabic is to find a similar example in Arabic script, even though Kufic is the earliest form of writing and has become obsolete for writing for centuries and is being used only for decoration. But Arabs want to look modern, so calling these typefaces Kufic is sugar coating a Latinized design. So I say Noto Kufi Arabic is not Kufic at all, It's Latinized. General Arab user doesn't see this. It looks cool to them, because it looks more like Latin. I guess now you can guess why there is not much Arabized typefaces out there? 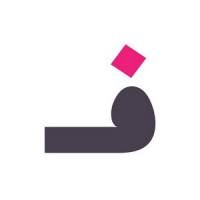 why there is a Noto Sans Arabic Arabic? Noto Sans existed before the Arabic part, so Arabic is an extension to "Noto Sans", ergo this "Noto Sans"+"Arabic" naming. How should the latter be classified? I can't tell! Because it looks Latinized to me and not Kufic at all. Maybe Monolinear is more moderate? Please note that the “Arab world” spans a large and diverse area and generalizations need to be careful. What is common id Dubai might not be as common in Beirut or Cairo or Algiers. 1. I’m not sure what monolinear mean here, low contrast or geometric designs? Geometric pseudo-Kufic designs seem to be common in some fields (e.g. advertisement) and some places. It is probably associated with being modern, and I think they are generally accepted, though some people would consider them backwards and a bastardization of the beautiful Arabic calligraphy. The majority of readers probably don’t care that much as long as the text is readable. Low contrast non-geometric designs seem to be a new trend, at least among certain groups of type designers. 2. I’d need a better definition of monolinear to answer this, see above. 3. Not sure about this either, but if you mean typefaces borrowing elements from the other script (what some people call “matchmaking”), then IMO the result in either script is a hideous beast. 1. Monolinear just means the strokes are (optically) the same width everywhere. Both geometric and not are fine. Can you point me to some low-contrast non-geometric designs? 3. Yes, I'm aware. I am looking for something quite ugly, or I will make it myself, which won't make it any less ugly. The point is not to make a useful typeface, but merely to use it for one or several experiment(s). Legibility is not so much an issue, but recognizing the shape as Arabic (as clearly as possible within the constraints) is. Can you point me to some low-contrast non-geometric designs? The new Noto Sans Arabic is in that category: the structure of the letters is informed by traditional naskh shapes and proportions, but with low-contrast strokes. The Arabic that I designed for Segoe UI (later extended by Titus Nemeth) is a hybrid in this respect: teeth letters and other verticals are geometric, to render sharply in the small ppem target UI environments, while bowl shapes are more humanist and reference naskh structures. Dubai font is another example of low-contrast non-geometric designs. BTW, I have to say that I don’t personally like many of the available designs in this category, they seem to lack in the aesthetics especially at larger sizes, while I find most geometric designs to be more aesthetically pleasing. I’m still waiting for a functional monolinear text design that is also pleasant to the eye. For an example of Arabicized Latin, there are https://www.myfonts.com/fonts/v-plu/amal/, and https://www.myfonts.com/fonts/pixymbols/faux-arabic/. Thanks a bunch @John Hudson and @Khaled Hosny!